Scattery Island is currently being developed as a destination for both cultural and eco-tourism. The island was acquired by Kilrush Community Development Ltd. in 1991 and is owned today by Dúchas (The Heritage Service). Dúchas has undertaken a number of improvements at Scattery Island in recent years including mainly the upgrading of the landing facilities to provide all-tide access to the island. A programme of further improvements is planned by Dúchas in order to enhance further the visitor experience and also aid the conservation of the fabric of the island. Dúchas has commenced work on the provision of visitor facilities on the island. The provision of these facilities will involve the conversion of an existing cottage on the island for use as an information centre, the provision of toilet facilities and the provision of a workshop to facilitate the national monuments workforce in undertaking works on the island. In addition, presentation works on the island have commenced involving the development of pathways and improvements to the island's built heritage. It is expected that these visitor facilities will be in place in time for the 2003 tourist season. The project is being funded by the Irish Government under the National Development Plan 2000-2006. Scattery Island is accessible via a short boat ride of 20 minutes from the Kilrush Marina. In 1998 a new landing jetty was developed on the island which has improved access for ferry operators. As well as being a destination for people with an interest in history and archaeology, the island is also of ecological interest with one of the few remaining examples of semi-natural grasslands in the country. Dúchas operates the Scattery Island Centre at Merchants Quay, Kilrush. This interpretative center houses an exhibition on the history of the buildings on Scattery and on the wildlife of the area. 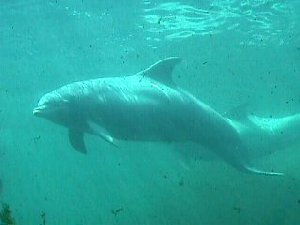 Kilrush is the main access point for those who wish to view the large group of bottlenose dolphins which lives in the Shannon Estuary and swims in the waters around Scattery Island. This school of breeding dolphins is unique to Ireland and is one of the most accessible groups of dolphins in Western Europe. A Dúchas approved vessel, the Dolphin Discovery, is used for dolphin-watching on the estuary, run by Gerry Griffin. The Dolphin Discovery was purpose-built for dolphin-watching and holds a Department of the Marine license. She carries a hydrophone on board to enable the passengers listen to the dolphins in their under water acoustic world when conditions are suitable.